How do you teach about Prognostication? 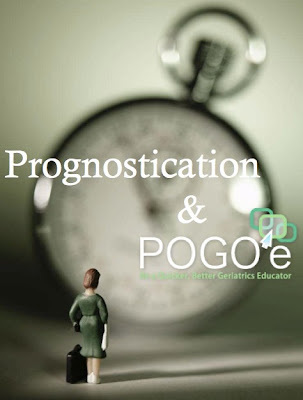 Prognostication is one of the most challenging concepts; however, there are some good teaching tools to get you started! The Medicare Hospice Benefit Game by Shaida Brandon received 5 stars as a teaching tool which makes card ‘gaming’ as a teaching technique easy for anyone to utilize. The Elder Care: A Resource for Interprofessional Providers: Disease Screening in Older Adults: When to Stop by Charles Moulton is a good handout on when to stop screening based on life expectancy. 3. Interactive Websites like ePrognosis are included as well (see POGOe link here). This is another tool that GeriPal readers will be familiar with and has a five star rating. This site is designed for older adults who do not have a dominant terminal illness. For patients with a dominant terminal illness, such as advanced dementia, cancer, or heart failure. It is a rough guide to educate and inform clinicians about possible mortality outcomes. There are many more great teaching resources out there, so please help us discuss and share those that you find helpful in the GeriPal comment section. Prognostication in geriatrics is well worth discussing. The same problem holds true in the understanding of pain. Reflex Sympathetic Dystrophy (RSD) (what is rsd?) is a disease not well known whose progression isn't well understood. Hopefully this post serves as a resource for those in geriatrics.